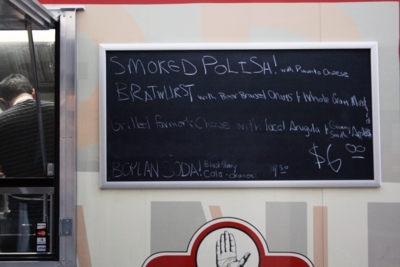 This food truck is a partnership between its owners and local, pasture-raised animal producers and butchers to offer sausage rolls. *Note: Farmhand Foods is now Firsthand Foods* A number of other local food bloggers have written their takes on Farmhand Sausage. I tried it out as part of the Snob Free Wine group, a local organization that exists for wine drinkers to unite casually, without pretension. 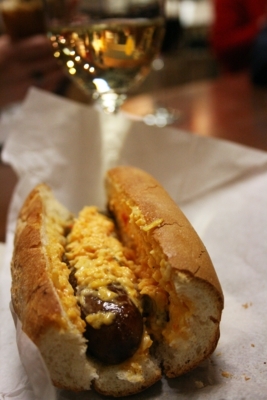 Not only did I enjoy the relaxed group, I also found my smoked polish sausage with pimiento cheese rather tasty. In all honestly, the sausage was good, but I’m no sausage connoisseur. The bread, however, was outstanding. It had a crunchy exterior and a soft, fresh interior and came from a local bakery—I don’t know which because I believe Farmhand uses a couple different companies. The pimiento cheese was by far the best I’ve had so far in my Southern foods samplings, in no small part due to the fact that it was warm and not overwhelmed with salt or mushed into an unappetizing lump. Also worth noting was the awesomeness of the sausage wagon’s workers running finished rolls inside 3 Cups, where we were chilling, as they were finished. It was cold out there! My sausage roll was tasty, though I was sad I didn’t get to try a spicy one instead. Anyone want to share thoughts on the spicy ones? 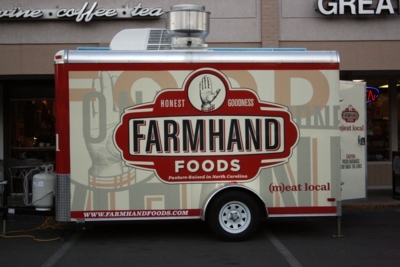 Farmhand Foods also offers at least one vegetarian option per menu, but they do sell out of all their offerings, so don’t be surprised if they come up with another item on the fly for vegetarian diners. Agh you’ve scooped me! I can’t wait to try this wagon but I haven’t been in the mood for sausage lately. This will help me muster the gumption to get out to the plaza.